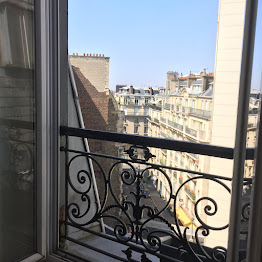 The residency is located in the 6th arrondissement in Paris on the 6th floor of a traditional Parisian building. From a very busy street very close to the Fnac (a French institution) and all sorts of other convenient shops, you cross into the quiet haven of a real Parisian courtyard into a secluded building where a tiny lift takes you up under the eaves to your very own 17 square meters of poetry. St Placide (on line 4) and Montparnasse-Bienvenue (lines 4,6,12,13) on rue de Rennes. It is 11minutes walk from the wonderfully contemplative Luxembourg Gardens (past where Gertrude Stein lived) with its many chairs. a further short walk will take you to the Panthéon, where a good number of French writers are buried as well as Napoleon and Marie Curie. The Montparnasse neighbourhood has a reputation in Paris for being the intellectual quarter. It is were Simone de Beauvoir and Jean-Paul Sartre hung out - they are buried in the famous cimetière Montparnasse, along with Baudelaire, Beckett etc.. Nearby, straddling the 5th and 6th arrondissement is the Quartier Latin, home to the university La Sorbonne and a number of other higher education establishments. With this comes a lively atmosphere thanks to all the students, and a large number of cafés and bistros, all waiting for you across the Jardins du Luxembourg. The Quartier Latin is also very popular with tourists but mention the 6th arrondissement to Parisians and whatever the exact connotation, you will usually get a nod of approval. You can reach the residency by plane or by train.There are many transportation options from the airports (Charles de Gaulle or Orly) or train stations to the residency (Metro Saint-Placide or Montparnasse-Bienvenue). Several options described below. The residency is approximately 10 minutes on foot from the Gare Montparnasse and 5 minutes from either Saint Placide or Montparnasse-Bienvenue Metro. However, if you have a large suitcase or two, consider pre-loading the Uber app if you'll have a smartphone or organizing one of the other door-to-door options detailed below. 2. Metro or bus. Cost: 1.90 euro Time: 25 minutes will take you from either station to a stop within a 5-minute walk from the residency. Our favourite app for figuring out public transport anywhere and for walking is city mapper. Especially the little star feature at the top right which allows you to save your trip on wifi before you head out and so save on roaming costs. It can even ring an alarm a minute before you reach your stop if you are prone to day-dreaming. The Paris Metro and Bus systems are fast and efficient. They are super frequent and you can't walk for 5 minutes without stumbling on a station. The cheapest way to buy metro tickets is in 'carnets' of 10 tickets (14.50 euro/10 as opposed to 1.90/each) from the vending machines or most any tabacs. Each ticket is valid for a single trip to any metro or bus stops in central Paris (anything within arrondisements 1-20). If you want to spend one glorious day going to loads of places the same day, you can buy a one day tourist pass. I don't recommend the monthly or weekly Navigo card as they are valid from the 1st day of the month (or week) to the last--not from the moment you buy it--and require a certain amount of administration, but if it happens to work with your dates, you have a spare passport photo, and you are intrepid and/or fluent in French, they are available for 22.15 euro/week or 73 euro/month.